Smarten your home with video functions. 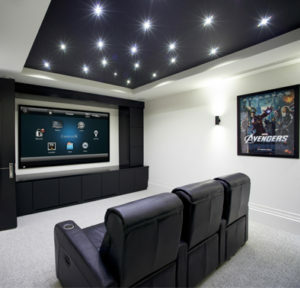 If you’re want to watch a movie at night, but want to watch the first half in the sitting room and the rest in your bedroom, what do you now? Currently, many people either don’t watch the film, or have to view it on the laptops. This inconvenience is avoided when you use smart video technology. Smart Video Technology allows you to pause, stop, play and rewind your television from any room in your house. You can now pause that film, head off to bed, get cosy, press play and watch the rest of it in your bed. In fact, you can integrate all of your videos and television across all devices. Similar to the video system, nowadays it is irritating and cumbersome moving from music device to music device in order to play all of the different music that you have. With our Audio System, you can actually integrate all of your music onto one device! More that that, you can have the music playing in both any room and any number of rooms in your house. With our audio system you no longer have to miss out on what the radio presenter said or have to stop and start the party somewhere else. Everything is now seamless. Lighting Technology allows you to be in complete control. From automated blinds, to dimmers and lighting settings, your home will light when, how and where you want. This is fantastic for mood lighting throughout the day and year and it is also a fantastic energy saver. Your home can learn your lighting wants and needs so you no longer even need to control them! Also, anytime you do want to change your lighting, it is easy from the push of one button on one integrated device. With the ease of lighting, audio, music and heating controls, your home becomes more comfortable than you had ever imagined. Relax, sit back and let your home do the rest. World class security cameras, remote access and occupancy simulation have all resulted in the safest home technology systems yet. You never need fret about the safety of your home no matter where you are. You home can fend for itself. The glory the above functions is that everything can be controlled from one integrated system. This allows you to set and change settings at the push of a button. Additionally, any new devices can be added to your system with ease, allowing for hassle-free of your home. This post was brought to you by CyberHomes – Ireland’s leading company in Smart Home Technology. For further information, check out our websites, or call us on 021 489 7367.